” If those responsible took notice and took heed Kieta Harbour wouldn’t be in this situation and we wouldn’t be talking about the oil spill now. What has happened is criminal. I think it is more than criminal because even if the people responsible are arraigned and put behind bars it may not rid the Harbour of the oil very well. I am writing this with a lot of hurt and annoyance. My people’s and my worst fear is now real. The oil spill is real. It is not in Alaska or the Gulf of Mexico or in the Middle East. It is at home. The waters of the Harbour come right ashore along the village beachfront where children swim and play everyday. Kieta Harbour is one of the most pristine, picturesque, much photographed and captivating harbours anywhere; anywhere in the Pacific Region, anywhere in the world. The Harbour is not big in comparison to other beautiful harbours I have seen in my travels around the world. But I have always thought to myself it is a big enough Harbour for the size of Bougainville Island. Every harbour in the world has its captivating features. Kieta Harbour has hers. I have no doubt captains and sailors of every ship, schooner, yacht, and sloop – even the penische the Germans may have used around here pre WW1 – that have come here for the first time, enter with a breathtaking welcome by the contrasting colours of the pristine blue waters and the rainforest green on all sides of the Harbour. Because the Harbour is also a shape of a water-filled crater the oil spill is, potentially, going to have a devastating effect. The Harbour is roughly encircled at both entrances with the snout and tail of Pokpok Island almost meeting the mainland at both entrances. It is almost like a large pond. This means any oil spill in the Harbour will get trapped in the heart of the Harbour, and spread along the coast of Pokpok and the mainland from Tubiana and all along Happy Valley and out. 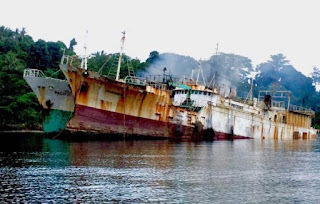 The principle signatory to the business arrangement and agreement that brought the ill-fated ships into Kieta is the local member for North Nasioi and Minister for Primary Industry Hon Nicholas Daku MHR. This is his second term both as a member of BHOR and as Minister in ABG. So he is someone that has matured into Bougainville politics and fortunate enough to have a bite at the same cherry as far as ministerial portfolios is concerned. Yet, during all this time he has been conspicuous by his overt absence and muted silence. The other signatory is an officer in the ABG Commerce division Raymond Moworu. As a matter of fact and record this is an ABG project, a project quickly cooked up and hushed up by the Minister on the eve of 2015 ABG election. Even if the Minister and the officer signed the papers blindfolded it does not exonerate them or make their responsibility – or culpability – any less because they were acting for and on behalf of ABG in promoting the project. When all is said and events come to pass the buck stops with the Minister. It is called ministerial responsibility. I’m very annoyed because I have personally mentioned the impending disaster to the Hon Minister Daku more than once verbally since 2016-17. I started doing this after I went around by boat to the Kieta government wharf where the ships had been berthed for some time. I first took photographs of the boats in March 2016 because I noticed they were not sailing anymore. It looked very obvious to me then the boats were fatigued and were rusting away into disrepair and wreck. I even posted the photographs with a warning on my FB Timeline observing that there were obvious signs of impending disaster and that the authorities must do something about removing the ships. If those responsible took notice and took heed Kieta Harbour wouldn’t be in this situation and we wouldn’t be talking about the oil spill now. It is futile and waste of time calling for a commission of enquiry especially when the Minister and ABG should have acted to prevent this after they were warned and could see the impending disaster was obvious out there staring into their face in broad daylight. The Minister has been AWOL and very hard to contact when all this has been going on. With all due respect he should resign. If he does not he should be decommissioned and relieved of ministerial responsibilities and someone else that is prepared to work and is serious about ministerial responsibility appointed to take charge. Party politics, including party allegiances, should not get in the way of such a decision. IF it doesn’t happen we might as well throw the towel in because otherwise we are complicit in a style of governance that isn’t going to deliver Bougainville where it wants to go. North Nasioi constituency also has the option to pursue the member through the recall provision in the constitution and evict him from Parliament. When I saw myself the ships were let off afloat from berth at the Kieta wharf the least I could do is ask someone – anyone – to help after contacting NMSA whose officers to their credit immediately turned up in Buka. Before their arrival I was very heartened that the member for Selau and Chairman of the parliamentary Committee on Referendum agreed and was, also of his own volition, so ready and willing to travel to Kieta with two of my senior parliamentary staff I asked to be at NMSA’s disposal on the visit to Kieta. The Member for Selau knows Kieta well and leaders from Kieta well. In Parliament he and Hon Minister Daku are sat next to each other. Pokpok has a historical link with Selau through Chief Keroro. Growing up in the mid 50’s I saw Chief Keroro arrive in his penische (dinghy) and would beach it in the village beachfront while he would spend time to visit and talk to our Chief at the time. These were times when Chiefs in North, Central and south Bougainville knew of each other. The other day I posted a piece on my FB Timeline with an old photo of Pokpok Island and village looking across from Kieta in a moving speed boat in 1989. I wrote about how the Islanders are resilient and generally how the folk in the communities around Bougainville are resilient in times of difficulties, disasters and other adversities. I was deliberate in the timing of that posting as I felt a disquiet anticipation that it was just a matter of time before one of the hapless ships would sink. This oil spill is something terribly alarming. Our Disaster office does not have the capacity to attend to it. It pains my heart to think how my people will be affected. I’m traveling away abroad on medical leave for the coming two weeks and even more pained not knowing the extent of the oil spill and its resultant effect on the Islanders and their livelihood from the sea they depend on in so many ways. Mr Ho the ships owner must be found. His second vessel is still afloat but has no anchor to keep it anchored safely anywhere. It is time for ABG to ask for help from GoPNG and from outside to assess and contain the spill.